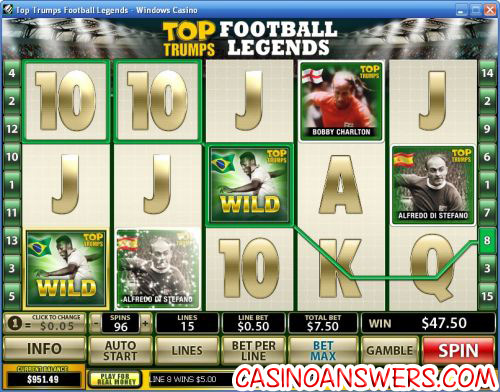 Top Trumps Football Legends Video Slot Guide & Review - Casino Answers! Top Trumps Football Legends is a 5-reel, 15-line video slot developed by Playtech, featuring scatter wins, wild substitutes, multipliers, a free spins feature, a gamble feature and a bonus game. You can play Top Trumps Football Legends at William Hill Casino and Bet365 Casino. Top Trumps is a popular card game and Football Legends (which this video slot is based on) is just one of the many themes available. Other Top Trumps card packs include Star Wars, The Simpsons, WWE, DC Super Heroes, Indiana Jones and many more. In the game, each card will have its own stats. The game can be played with two or more players. The cards will be dealt out to all of the players, with each player getting at least one card. The first player will select the category from his first card and read out the value. Then, the other players will read their value from that same category. The player with the highest value will win the “trick” and take all of the losing cards to place them at the bottom of his pile. The winning player will then take their next card and pick the category for the next round. Top Trumps Football Legends is a video slot featuring 30 different football (or soccer) greats of the past and present, including Pele, Johan Cruyff, Alfredo Di Stefano, Bobby Charlton, Franz Beckenbauer, Michel Platini and many more. There are also Ace, King, Queen, Jack, Ten and Nine symbols, despite the fact that the game features more than enough football stars to fill out all of the symbols in the game. To play the Top Trumps Football Legends slot machine, set the coin value at $0.01, $0.05, $0.10, $0.25, $0.50, $1, $2 or $5. Then, you can set your bet per line at 1-10 coins and your number of active paylines (up to 15). The smallest possible bet you can make is $0.01 (one cent per line on one payline). The highest bet you can make is $750 ($50 per line on all 15 paylines). With a betting range like that, Top Trumps Football Legends is ideal for all types of casino players. To play the maximum bet on your coin value (10 coins at 15 paylines), use the “Bet Max” button. To play the video slot with your current wagering settings, simply hit the “Spin” button to play. 5 Pele symbols on the Top Trumps Football Legends video slot will win you the 10,000 coin top jackpot. The Pele symbol is the wild symbol in the slot game and will substitute for all symbols except for the Wall of Fame bonus symbol and Scattered Top Trumps symbol. Top Trumps Football Legends’ scatter symbol is the Top Trumps logo. Three, four or five scatter symbols and you will be awarded 10 free games with extra wild symbols (a football legend of your choice) added to the game. Your extra wild symbol will substitute for all symbols in the game except for the Top Trumps scatter symbols and will act as a 4X multiplier. The Wall of Fame bonus game cannot be triggered during free games. Additional free spins can be won to infinity. After any win on Top Trumps Football Legends, you can choose to risk your winnings to double or double half of your winnings. Hit the gamble button after a win to open the gamble feature. Once you have chosen either “Double” or “Double Half,” the dealer will turn over the the card at the very left. You must choose which of the four remaining cards will be higher than the dealer’s card to win. To back out and collect your winnings, use the “Collect” button or you can play more rounds. Each casino will have a double up limit that is listed in the paytable. In the case of Windows Casino, the double up limit is $5000. There are a few extra gameplay features on the Football Legends slot machine. One of them is a basic autoplay feature. Simply input the number of autoplay spins up to 99 and hit the “Auto Start” button to begin. You may cancel the autoplay spins by using the “Stop” button that replaces the “Auto Start” button, as opposed to the red one. The red “Stop” button replaces the “Spin” button during a spin and can be used to skill stop the reels on the Top Trumps Football Legends video slot. Top Trumps Football Legends has a ton of special features – a gamble feature, a free spins feature and a bonus game – in addition to a very good 10,000X top fixed jackpot. There’s not much more you can ask for in a video slot, besides perhaps a progressive jackpot. In addition to all of that, we know that the football hooligans out there will enjoy the theme, especially if their favourite player is among the 30 featured in the slot game. To try out the Top Trumps Football Legends video slot, sign up and make your first deposit today at William Hill Casino to receive a 150% signup bonus up to $300. As an added bonus, you can also do your football betting while you’re at William Hill! For all of that and much more, head over to William Hill Casino! 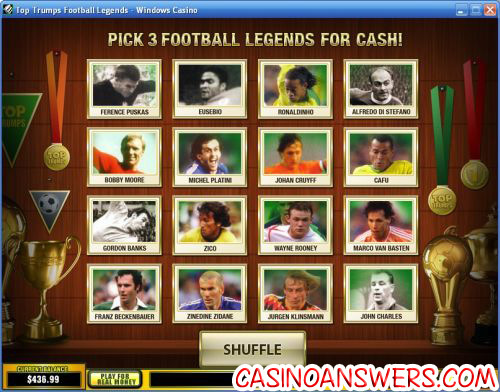 Can USA casino players play the Football Legends video slot for real money? USA players are unfortunately unable to play Top Trumps Football Legends at Playtech online casinos. However, American players are free to sign up and play a soccer-themed slot machine called Global Cup Soccer and also check out the iSlots (interactive video slots) at the USA-friendly Slots Jackpot Casino. Does Top Trumps Football Legends have a progressive jackpot? A progressive jackpot is just about the only thing you can’t find on the Top Trumps Football Legends video slot. What you can find on Football Legends is a 10,000 coin top fixed jackpot, a bonus game, a gamble feature and you can also win 10 free spins with a 4X multiplier! We would say that sufficiently makes up for the lack of a progressive jackpot. What World Cup Casino Games are there? Are there any World Cup Flash Games I can play online?